The story of Prussian blue begins with an accidental but fateful discovery made in an alchemist's laboratory in Berlin in the early 1700s. As we shall see, it was a discovery that would electrify the art world and prove to have valuable applications in many fields, ranging from medicine to technology. But there was also a much darker side – as we shall see in Part 2, Prussian blue would also come to play a part in many deaths and, ultimately, in a human disaster of almost unimaginable proportions. The Berlin laboratory where this story starts was run by a German named Johann Dippel. Originally a theologian and physician, Dippel had become interested in alchemy, and had moved to Berlin in 1704. At that time, Berlin was somewhat of a centre for alchemists, though the penalty in cases of fraud (or failure) could be high – one prominent Berlin alchemist was hanged after failing numerous times to produce gold for the king . With the benefit of some highly-placed patronage, Dippel's original efforts were also directed at transmuting base metals into gold. But when that proved unfruitful, his efforts turned to the equally over-optimistic task of finding a universal medicine. The supposed key to this was a substance that Dippel called “animal oil”, produced through the distillation of animal blood to which potash had been added . Around 1706, Dippel had been joined in his laboratory by a colour-maker named Diesbach. One afternoon, Diesbach was engaged in producing Florentine Lake, a red pigment based on cochineal. Having run out of the potash he needed, he borrowed some from Dippel. Unknown to him, however, this batch of potash had been contaminated by the iron in the blood used for Dippel's animal oil. The result was startling – when Diesbach checked the next morning, he found a dense blue pigment instead of the red that he would normally have expected. Further testing revealed that the new pigment was stable, or colour-fast, an important attribute for use in artworks. Artists had traditionally struggled to find an inexpensive, stable, brilliant blue pigment for their artworks. A gap had been left after the knowledge of the ancient recipe for Egyptian blue had gradually been lost. At the time of Diesbach's discovery, the most commonly used blue resources were indigo, smalt, azurite and ultramarine, derived from lapis lazuli, which was expensive and normally had to be imported . A blue pigment that was less expensive, non-toxic, colour-fast and readily available would be a godsend. It is not surprising, therefore, that the commercial possibilities of Diesbach’s fortuitous discovery were quickly realised. By 1709, the name “Prussian Blue” had already been coined , and there were now two men claiming credit for the invention – Diesbach himself and a Johann Frisch, who had become involved in the pigment's commercial distribution and sale . Soon, the laboratory owner Dippel, who had in the meantime fled Berlin to escape a possible theological prosecution, had also started producing Prussian blue from his new base in the Netherlands. By 1724 the secret of Prussian blue's recipe had become widely known, due to its publication in a paper delivered to the Royal Society in London. Large scale production began throughout Europe, becoming considerably more refined in the process . The demand from artists for the new pigment was enormous, and it quickly gained widespread adoption in both oil painting and watercolours. The first recorded user was the Berlin-based Swiss artist Christof Werner, though the earliest verified use in a particular painting was in the Entombment of Christ (1709) by the Dutch painter Pieter van der Werff (Fig 2) . French painters were also using the pigment as early as 1710, including Nicolas Lancret and Antoine Watteau in his celebrated Embarkation to Cythera . Among many others, Canaletto was an early adopter, using Prussian blue for his skies by 1719. In the coming decades, Prussian blue would grow to become a staple ingredient on artists' palettes all over Europe. It would be used by artists as varied as Gainsborough (for example, in Mrs Siddons, 1785), Sir Joshua Reynolds, Vigée-Lebrun (Portrait of Theresa Countess Kinsky,1793), Delacroix (Pieta, 1850) , JMW Turner (The Fighting Temeraire, 1838), Vincent van Gogh (The Starry Night, 1889) (Fig 3) and Vigée Le Brun (Fig 3a). While the pigment in its pure state produced a deep blue appearance, it was also amenable to being mixed with other pigments. 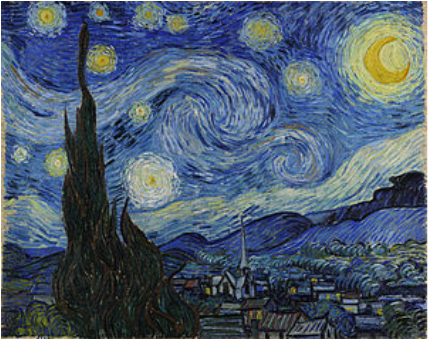 So, for example, green colours could be produced by mixing Prussian blue with yellow – van Gogh would later mix Prussian blue and chrome yellow to depict a green garden scene . It could also be used in association with ultramarine – Watteau, for example, mixed the two pigments, and Lancret's practice was to use ultramarine for skies and Prussian blue for figures, and sometimes to mix it with green . During the 18th century, Prussian blue was commonly mixed with white lead, to produce lighter shades, though it now seems that this reduced its resistance to fading . Prussian blue's influence was also felt outside the West. Its export to Japan, which increased significantly in the 1820s, would prove to have major implications, with its vividness, tonal range and “foreign-ness” combining to make it somewhat of a sensation. Commentator Henry D Smith even described its effect in Japan as a “blue revolution” . Japanese woodblock painters had previously created blue from vegetable dyes made from dayflower petals, or natural indigo. These were prone to fade when exposed to light, with the result that the blues in many 18th century prints gradually faded to a tan or beige . Prussian blue made it possible for artists and print publishers to create a wider range of much more vivid and lasting blue hues. Katsushika Hokusai's Thirty Six Views of Mount Fuji (1830) made early and prolific use of the new colour, a feature that was highlighted in the publisher's advertising for the series . Some of the prints in this series were entirely in shades of blue, contributing to an all-blue aizuri style in the process . Others, including the now-famous Great Wave off Kanagawa (Fig 4), were predominantly in blue, with the new pigment proving to be particularly effective in expressing depth in water and atmospheric distance -- spatial qualities that were so important in landscapes and seascapes. Like Hokusai, Utagawa Hiroshige also used Prussian blue extensively in his landscape prints, such as his Full Moon at Tsukuda (Fig 5). Timothy Clark has even suggested that the new colouring became so popular that it may have been the major factor in establishing pure landscape as a new genre of ukiyo-e print . When the Western craze for collecting Japanese woodblock prints began in the 1860s, those featuring Prussian blue were the most prized; ironically, the very boldness of the Japanese usage of the pigment, with its impressive depth and tonal range, misled Europeans to assume that this was a novel new colour, which they initially called Hiroshige blue. It was only later that it was realised  that this supposedly-quintessentially Japanese colour was itself an “old” European invention. Prussian blue’s value was not limited to artworks. It was very early adopted for inks, including those used on postage stamps, perhaps most notably in the Mauritius 1847 two-pence stamp (Fig 6), now classed as one of the rarest and most valuable stamps in the world . The pigment was also used for textile dyeing and later for laundry bluing. It was the main colour used in by infantry and artillery regiments of the Prussian army from the 18th century up until the early 20th century. Prussian blue was the basis of the first ever industrial photocopying process, invented by the chemist John Herschel in 1842. As a very early adopter of the newly-invented photography (see our article on early influences of photography), Herschel realised that if he held a pattern drawn on tracing paper over photo-sensitive paper and exposed them both to a light source, the parts that were not protected by dark lines would change their chemical formulas in the light. As described by Victoria Finlay, they would shift subtly from ammonium ferric citrate to ammonium ferrous citrate. If the paper was then dunked in potassium ferrocyanide, the ferrous bits would turn into Prussian blue, while the ferric ones would stay neutral. The resulting ghostly pattern of white lines on blue paper became known by the now-familiar term “blueprint” . Prussian blue also has its medical uses. It is used in pathology tests for bone marrow. It can also be administered orally to people who have become internally contaminated with thallium or radioactive caesium. It acts by trapping the thallium or caesium in the gut, thereby increasing its faecal secretion. It was used with varying levels of success in treating victims of the 1987 radioactive contamination accident in Goiânia in Brazil . In solution, films of Prussian blue can appear either as their normal dark colour or as colourless, depending on the type of electrochemical charge that is applied. It is possible that this process, called electrochromism, can be applied in the development of “smart” windows which can reversibly change their transmission of light between very high and very low values. The pigment may also have applications in the construction of sensors for clinical, environmental and food analysis . While Prussian blue has had many beneficial uses, there is also a dark side to its story. Like its original invention, this came about in an unexpected way. It had been recognised for thousands of years that many plants – such as cherry laurel leaves, peach pits, cassava and even apple pips – are potentially poisonous, with the poison often being detectable by its distinctive odour of bitter almonds. While the naturally occurring poison is normally only present in very small doses , it can be lethal if delivered in concentrated form. Peach pits, for example, were used in judicial executions (described as the “penalty of the peach”) as far back as the ancient Egyptians. The ancient Romans used cherry laurel leaves as an execution method (the “cherry death”), and the emperor Nero used them to poison members of his family . To take a more modern example, an inheritance-seeking Englishman, Captain Donnellan, was convicted in 1781 of a poisoning murder by using laurel water infused from cherry leaves . Despite this long-established usage, however, it was not until 1782, the very next year after Donnellan was hanged, that the active toxic ingredient was identified. The breakthrough was made by the Swedish pharmaceutical chemist Carl Wilhelm Scheele, and it involved an unlikely culprit. Scheele discovered that if he mixed Prussian blue with diluted sulphuric acid, he was able to produce a “new” gas that was colourless, water soluble and acidic. We now know this gas as hydrogen cyanide (HCN), a name derived from the Greek kyanós for “dark blue”. In its soluble form, it was called blue acid (blausäure) in German, and as prussic acid in English. Even in small doses, it would prove to be one of the most deadly of all poisons. Today we know it by its more common shorthand name – cyanide. On ingestion by humans, cyanide is absorbed rapidly into the blood from the intestines and other mucous membranes. It acts by binding irreversibly to the iron atom in haemoglobin (blood), which prevents the blood from transporting oxygen to the body's cells and tissues. Symptoms include rapid heartbeat, headache and drowsiness, followed by coma, convulsions and death by asphyxia. To some, there is a slight smell of almonds, which may persist in the stomach contents of victims. Cyanide’s newness and extreme toxicity resulted in a number of accidental, but almost invariably fatal, overdoses, and to its use in pest extermination or even as a lethal agent for harpoons on whaling ships . But it would also make it extraordinarily effective in one other thing… murder. Perhaps the most notorious and sensational example of prussic acid poisoning occurred in England, on the evening of New Year's Day 1845. A man dressed in the long dark coat and broad-brimmed hat of a Quaker was seen hurrying away from the house of Sarah Hart in the village of Salt Hill, in Aylesbury, just outside London. The witness to the man's departure, a next-door neighbour, had been alerted that something was wrong by hearing several alarming groans coming from Sarah's house, and had gone out to investigate. The appearance of the departing man was familiar to her, as he had been a regular visitor to Sarah's house for some time. But he brushed past her, refusing to answer her concerned queries as to what had happened, and disappeared down the road toward the local railway station. Curious, and a little afraid, the neighbour ventured into Sarah's house. She found Sarah sprawled on her back, moaning and panting for breath, frothing at the mouth and with her clothes in disarray. A half-drunk bottle of porter ale was on the table. A few minutes later, a local doctor called to the scene declared Sarah dead . The escaping man, still wearing his distinctive clothing, eventually caught the 7.42 train from Slough to London, where he obviously felt that his trail would be lost. He was not to know that the attending doctor and a companion had followed in his footsteps to Slough station and had seen him catch the train. But what could they do about it? They could hardly chase the train. Fortunately for the pursuers, however, a technology even newer that the railway was about to play its part. The electric telegraph – the first commercial use of electricity -- had only recently been invented, with the prototype being developed in 1837 by the Briton Charles Wheatstone. In 1845 it was still regarded as something of a novelty, with great scepticism as to its future usefulness. But, by an extraordinary and fateful chance, one of its first installations was on the Great Western Line, between Slough Station and London's Paddington Station, just 18 miles (30 km) away (Fig 7). The original version of this line, established in a truncated form in 1839, was actually the world's first operational electric telegraph . The message reached Paddington station in what then seemed a miraculously short period of half an hour, just a few minutes before the Quaker's train was due to arrive there at 8.20. After an initial delay caused by confusion over the idiosyncratic spelling of kwaker , the Paddington station telegraph operator alerted his superiors and the railway police, one of whom followed the suspect once he disembarked from the train. The suspect was eventually arrested the next day at a coffee house. He was identified as John Tawell, “a gentleman and a merchant”. John Tawell had unwittingly scored a unique double – not only did he become probably the first person to make his escape from a murder scene by catching a train, but he also became the first person to be arrested as a result of a telegraph message. As one local newspaper put it, “Steam bears him off more rapidly than the winds of heaven; but the electric current is his pursuer” . Impressed commentators were prompted to dub the telegraph as “the electric constable” or “God’s lightning”, and the telegraph lines were described as “the cords that hung John Tawell” . Unfortunately for Tawell, as we shall see, these were not to be the only unwanted firsts that he would achieve. The role played by the telegraph in Tawell’s arrest was a major factor in its gaining general acceptance. As one commentator wrote at the time, “The telegraph … might have continued for some time longer in obscurity but for its remarkable agency in causing the arrest of the Quaker Tawell. This event … placed it before the world as the prominent instrument in a terrible drama, and at once drew universal attention to its capabilities” . Fig 7a: Punch cartoon of malefactor being caught by the "ëlectric constable"
John Tawell certainly did not look like a murderer should. A short and slender 61year-old with “the most thorough air of a Quaker” (Fig 8) , he appeared to be a sober, prosperous and respectable gentleman, with a wife and two children. But he had a complicated and partly hidden past. He had in fact been disowned by the Quakers as far back as 1809, for “sexual misconduct”. In 1814, he had been convicted of possessing forged bank notes, and been sentenced to 14 years transportation to Sydney Town, some 12,000 miles away. By 1820, however, after obtaining a conditional pardon, he set up as an apothecary in what would be Sydney's first retail pharmacy. The business prospered, and he would eventually make a fortune there with astute property deals . He eventually returned to England in 1828 as a rich (and free) man. A few years later he returned to Sydney, partly for health reasons, and partly because business prospects appeared to be brighter there than in London. In Sydney he was instrumental in setting up the first Australian branch of the Quaker movement , financing a new meeting hall which he combined with a girls' school, and carrying out various philanthropic projects. Essentially now completely rehabilitated, at least in his own eyes, he returned once more to England. Despite his good deeds, however, his felonious past still dogged him; the Quakers still denied him official membership. His real problems, however, began when he hired a nurse to care for his ailing wife. After she died, he secretly carried on an affair with the nurse. When he later remarried, he arranged for the nurse to live in cottage out of London, and paid her regular allowances to support the children of their union. The nurse adopted an assumed name. It was none other than the unfortunate Sarah Hart. Tawell’s arrest in such novel and dramatic circumstances, coupled with his Quaker connections, the gruesomeness of the death, and the suggestion of a secret lover, all combined to create a national sensation. Not surprisingly, it filled the newspapers for months . As Beppe Sabatini has noted, the hysteria surrounding criminals such as Tawell was “scarcely to be believed. Cheap penny broadsides of criminal deeds and confessions were purchased—incredible as it seems—in the millions; and outsold Dickens by one hundred to one. Dreary junk, much of it fabricated by the printer, these broadsides were unquestionably among the most widely-read material throughout all of Britain” (Figs 9A, 9B) . Murder by poisoning has always its own peculiar fascination in the public mind. This type of crime is almost always premeditated and cold blooded, somehow intimate yet cowardly, with the victim forced to face an extremely agonising end. The means are often invisible and rarely obvious, unlike an honest stabbing, shooting or bashing. And suicide or accident are in many cases just as consistent with the facts as murder. These difficulties are magnified where the forensic evidence is not strong. At the time of Tawell’s trial, there had not been a successful conviction involving cyanide for over 60 years . Moreover, forensic science was in its infancy. Tawell’s trial, which featured a number of conflicting testimonies, would not just be a test for Tawell, but also a test of the value of “expert” evidence. None of the reputedly expert witnesses who gave evidence at the trial had any real-life experience of human cyanide poisoning. On the state of medical knowledge at the time, there was no agreement about the dosage necessary to cause death, nor whether cyanide poisoning was invariably associated with a smell of bitter almonds, as was popularly believed. At this time, too, many jury members had limited educations and were simply not equipped to properly evaluate the technical evidence given. Despite this, the evidence against Tawell seemed very strong. He had been seen hurrying away from the murder scene. As a former chemist he had a knowledge of poisons and had, in fact, purchased a bottle of prussic acid shortly before he visited Sarah. When arrested, he had initially lied about his whereabouts, and even about his knowledge of Sarah’s existence. Evidence of his philanthropy and good character was more than counteracted by his criminal past and the fact of his secret affair. And finding a motive was not a problem — a temporary cash flow problem which he happened to be experiencing at the time provided some sort of motive for his wishing not to have Sarah continuing to be a drain on his resources. . Moreover, the defence provided by his eminent lawyer Fitzroy Kelly (Fig 10), primarily an expert in commercial law, was long on rhetoric and short on facts. The defence also suffered from an ill-advised attempt to blame the death on Sarah’s apparent consumption of large amounts of cyanide-bearing apple pips in the days preceding her death – the lawyer would acquire the derisive nickname of “Apple Pip” Kelly for years afterwards . It was also directly contrary to Tawell’s earlier (and seemingly more credible) claim that Sarah had actually poisoned herself when she realised that he would no longer support her.The presiding judge’s hostile summing up was probably the last nail in Tawell’s coffin – the jury took only half an hour to bring in a guilty verdict. Tawell thus collected some more unwanted firsts, becoming the first man to be convicted of murder by prussic acid in Britain that century, and almost certainly the first Quaker murderer as well. At this time, the automatic penalty for murder was death by public hanging. These events normally drew enormous, boisterous crowds and had a distinctively festive air, particularly in cases as sensational as Tawell’s. Onlookers poured in by train to Aylesbury. As one commentator observed, “every minute spot from which a glimpse of the gallows could be obtained was occupied, and the concourse of spectators was immense and beyond all computation” . Yet opposition to the very idea of capital punishment was slowly growing, fuelled in part by the fear that a wrongful conviction might lead to an irreversible execution. Charles Dickens, for example, was originally a strong opponent, writing a series of letters to the Daily News on the topic. He commented on its “horrible fascination” for even “good and virtuous and well-conducted people”, noting that Tawell's trial, among others, had “awakened a vast amount of this depraved excitement”, which had attained an “unusually indecent and frenzied height” . Despite a number of petitions for mercy (including one supported by Dickens and signed by the foreman of the jury), Tawell was hanged at Aylesbury on the cold and bleak morning of 28 March 1845. According to most accounts, the executioner Henry Calcraft botched the job, not allowing enough rope for the drop, and Tawell “died hard”, taking an excruciatingly long time to strangle to death . Apparently even the crowd fell silent. It was later revealed that Tawell had supposedly made a full confession to the prison chaplain on the previous night, admitting that he had lived in constant dread that his wife would find out about his relationship . Public executions took some time to be outlawed in England, finally being abolished in 1868, though it appears that Dickens’ views played a significant role in this change. The spectacle of botched hangings, such as John Tawell’s, would also have played an important part. Cyanide has gone on to have many modern applications in mining, industry and medicine . However, its toxicity to humans has continued to be a particular attraction for those interested in killing, both legally and illegally. In the United States, for example, following on the ancient practices of Egypt and Rome, it was used at various times during the 20th century in judicial executions. This was usually achieved by combining cyanide salt with sulphuric acid and releasing it in a gas chamber in which the subject was restrained. Death normally followed within 5 to 10 minutes (Fig 11) . Cyanide was also used in the multiple Tylenol contamination murders in 1982, in which seven people died, and in the mass deaths of more than 900 adults and children as part of the Jonestown cult tragedy in 1978. “I visited Treblinka [another extermination camp] to find out how they carried out their extermination. The Group Commandant told me that he had liquidated 80,000 in the course of one half year. He was principally concerned with liquidating all the Jews from the Warsaw ghetto. He used monoxide gas, and I did not think that his methods were very efficient. So at Auschwitz I used Cyclon [Zyklon] B, which was a crystallised prussic acid dropped into the death chamber. It took from three to fifteen minutes to kill the people in the chamber, according to atmospheric conditions. We knew the people were dead when their screaming stopped. We usually waited about half an hour before we opened the doors and removed the bodies. After the bodies were removed our special commandos took off the rings and extracted the gold from the teeth of the corpses. Another improvement that we made over Treblinka was that we built our gas chambers to accommodate two thousand people at one time…” . Although estimates differ widely, it is generally now accepted that well over a million prisoners were executed with hydrogen cyanide in this way. Ironically, cyanide also became a preferred method of committing suicide in high Nazi circles in the final stages or aftermath of the war. Apparently, Goering, Himmler, Hitler’s wife Eva Braun, and the Goebbels children all used it. Tragically, it was also a principal method of suicide for thousands of people among the general population in Germany as defeat became inevitable . Prussian blue's story, while sensational and shocking in many aspects, is also instructive in a number of rather more prosaic ways. First, it is a reminder of the close connections between art and chemistry – both for good or for evil. As Philip Ball has pointed out, many advances in chemical technology and the chemicals industry have depended on the social demand for colour. In turn, many advances in the composition and techniques for artworks have depended on chemical discoveries . It is also a striking example of the role of serendipity and accident in the development of both art and technology. Many of the steps in this story – starting with the discovery of Prussian blue itself, its impact in Japan, the development of its horrifically-lethal derivative, and its possible uses in advanced technology – could not easily have been anticipated. Its story is a reminder that sometimes what we take to be logical developments only appear so with the illuminating benefits of hindsight. Note: For other articles on art colours, see Egyptian Blue: the colour of technology and The Life and Death of Mummy Brown. 1. The alchemist was Domenico Caetano: see Alexander Kraft, “On the Discovery and History of Prussian Blue” Bull. Hist. Chem, vol 33, No 2 (2008) at 64. 2. Kraft, op cit at 61-2, citing correspondence between Johann Frisch and Gottfried Liebniz, over the period 1708-16. See also note 5. 3. The name ultramarine is itself based on the Latin for beyond the seas. 4. Kraft, op cit at 62. The name Berlin Blue was also used. 5. It was Frisch’s correspondence with the German mathematician and philosopher Gottfried Liebniz, which provides much of the background to Prussian blue’s early days: see Kraft, op cit. The other source is G E Stahl, Experimenta, Observationes, Animadversiones (1731) p 280-283. 6. Prussian blue is technically ferric hexacyanoferrate(II). Its actual chemical composition is extremely complex and was only finally determined in the 20th century as Fe7(CN)18·xH2O (x = 14–16). 7. Kraft, op cit at 63; Jens Bartoli, “The Early Use of Prussian Blue in Paintings”, Paper delivered at 9th International Conference on Non-Destructive Testing of Art, Jerusalem, 25-30 May 2008. 8. This painting contains a mix of Prussian blue and ultramarine. 12. Jo Kirby and David Saunders, “Fading and Colour Change of Prussian Blue: Methods of Manufacture and Influence of Extenders”, National Gallery Technical Bulletin, Vol 25, 2004. Alternatives to Prussian blue would later be developed, such as the 19th century syntheses of cobalt blue and artificial ultramarine and, more recently, the intense blue pigment phthaloryanine blue. 14. Gary Hickey, “Waves of Influence: Japan and the West”, in Exhibition Catalogue Monet & Japan, National Gallery of Australia, Canberra, 2001, at 176 and references there cited. See also our article on Floating worlds. 15. Matthi Forrer, Hokusai: Mountains & Water, Flowers and Birds, Prestel Verlag, Munich, 2004, at 10 ff. 17. Timothy Clark, 100 Views of Mount Fuji, The British Museum Press, London, 2001, at 46. Other artists to use it included Eisen, Kunisada and Sadahide. 18. Kraft, op cit; Hickey, op cit. 19. John M Chalmers et al (eds), Infrared and Raman Spectroscopy in Forensic Science, John Wiley & Sons, 2012; Tracey D Chaplin et al, “Identification by Raman microscopy of pigments on early postage stamps”, Journal of Raman Spectroscopy (July 2004), Vol 35, Iss 7, p 600-604. 20. Victoria Finlay, Colour: Travels through the Paintbox, The Folio Society, London, 2009, at 296. 21. International Atomic Energy Agency, The Radiological Accident in Goiânia, Vienna 1988. One surprising side effect of taking Prussian blue can be that the person's faeces turn blue. 22. Kraft, op cit at 65. 23. Although, under certain conditions, such as rapid regrowth after drought, the poison can also naturally collect to lethal concentrations in some plants, which can cause death to ruminant animals: Dr Sarah Robson, “Prussic acid poisoning in livestock”, NSW Department of Prime Industry, primefacts, February 2007. 24. Dr Steven I Baskin et al (eds), “Cyanide Poisoning”, in Medical Aspects of Chemical Warfare, Borden Institute, Washington, 2008, at 372-3. 25. Carol Baxter, The Peculiar Case of the Electric Constable, Oneworld Publications, London, 2013, at 271; Daniel Drake et al (eds), The Western Journal of the Medical and Physical Sciences, Vol XI, No XLIV (1838), 610 ff. Hydrogen Cyanide (Prussic Acid): Lizzie Borden's Preferred Method”, WebmedCentral Toxicology 2010; 1(10). 27. For an excellent, comprehensive account of the Salt Hill murder and trial, see Carol Baxter’s The Peculiar Case of the Electric Constable, op cit, which I have used extensively in preparing this section of the article; see also J.K. Fowler, Echoes of Old County Life: being recollections of sport, politics and farming in the good old times, Edward Arnold, 1892, at 127 ff. 28. This was five years before the American Samuel Morse's famous “What God hath wrought” message sent on an experimental telegraph line in 1844. A precursor of the electrical telegraph, the optical semaphore, was invented in 1792 in France. 29. This was finally resolved when it was realised that it must mean Quaker – the early telegraph machine did not contain the letter “q”. 30. Quoted in Baxter, op cit at 28. 31. See Part 2 of our article Art in a Speeded Up World. 32. Andrew Wynter, “The Electric Telegraph”, Quarterly Review, June 1854 pp 118-164. 34. For an informative coverage of Tawell’s Sydney experiences and property deals see Jill Buckland, Mort’s Cottage 1838-1988, Kangaroo Press, Kenthurst NSW, 1988, p 9 ff; Baxter. op cit. 35. More accurately, the Religious Society of Friends. 36. See Part 2 of our article Art in a Speeded Up World. 37. Richard D Altick, English Common Reader: A Social History of the Mass Reading Public 1800–1900. Chicago: University of Chicago Press, 1957 at 382. 38. This was Captain Donnellan’s “laurel leaf” conviction, referred to earlier. 39. Though this evidently did not hinder his career: he later became the Attorney General, a judge and a member of the Privy Council. 40. Robert Gibbs. Buckinghamshire: A History of Aylesbury, Robt Gibbs, Aylesbury, 1885. 41. Letter by Charles Dickens to the Daily News, 28 February 1846. Dickens later became more conservative in his views, believing only that capital punishment should be carried out in private (Letter to the Times, 14 November 1849). 42. Judith Flanders, The Invention of Murder, Harper Press, London 2011, at 330; Baxter, op cit at 321. 43. Enormous controversy later arose about the fact that a signed confession was never released. Even after his death, however, Tawell continued to make headlines. Back in Sydney, an extraordinary dispute over the sale of his estate’s properties enveloped the New South Wales Solicitor General, leading to a scandal which resulted in his offering his resignation and prompting a constitutional crisis: Baxter, op cit at 341. 44. Some of these continue to raise concerns about environmental or health effects; see for example Jan G. Laitos, “Cyanide, Mining, and the Environment”, 30 Pace Envtl. L. Rev. 869 (2013). 45. Baskin, op cit at 373-4. At one execution in New Mexico, the victim was reportedly advised to take deep breaths of the fumes in order to reduce his suffering: James Nye. “From gas chambers to department stores: Haunting images reveal execution sites across 18 states where the death penalty was dealt out”: Daily Mail, 26 January 2014. 46. Baskin, op cit at 373. 47. Allan Bullock, Hitler: A Study in Tyranny, Pelican Books, Middlesex, revd edn 1962, at 703. 48. Quoted in Bullock, op cit at 701. 49. Christian Goeschel, Suicide in Nazi Germany, Oxford University Press, Oxford, 2009. 50. Philip Ball, “The Colourful Science”, Chemistry World, 19 June 2014.